Penguin Time in Chile ! 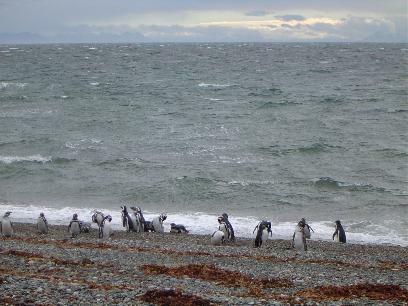 I was intrigued how they could swim and come ashore, I was amused how they walked, and they gave me a feeling that wildlife still existed on this planet, that there was still some birds that were wild enough to come again and again to the same spot and just do what they do... being penguins. So I was thrilled to meet again. The location : Otway sound, Chile. The weather : windy, rainy, cold - ideal conditions for our little friends. 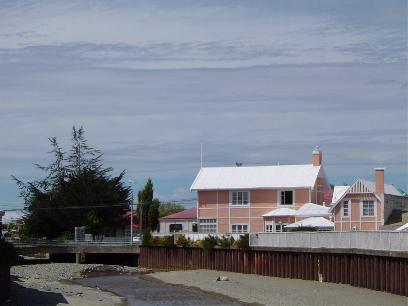 Punta Arenas is a small city, overlooking the Straits of Magellan. The Straits of Magellan were for a long time the favored way for ships to go from the Atlantic to the Pacific, for traders and explorers alike. When Magellan first traveled this part of the world, and discovered this passage, he saw a lot of fires to the west - he called this part of the world "tierra del fuego" (land of fires). The fires were made by the indigenious people. On the plaza in Punta Arenas, a statue remembers the explorers and the 'wild' people they conquered. A popular excursion out of town is a two hour ride to the Otway sound, where the penguins live. It was rainy, very windy and cold, the sea was wild. 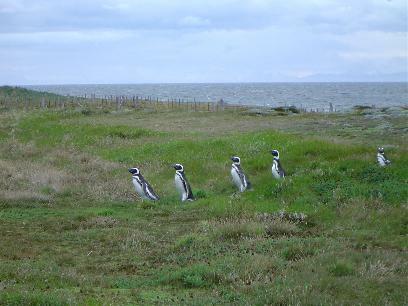 This is the usual weather over here, this is Patagonia, this is penguin area! The national park is not that big but offers good opportunities to enjoy the way of life of the penguins. There are great photo opportunities everywhere. As soon as they come out of the ice cold water, they clean their feathers with their beaks. It is amazing how smooth they can make the transition from swimming to sliding on the water and eventually walking. And then they begin their funny walk to their nest - they always use the same nest and the same pathways to go there. When you study them closely - and there are many opportunities to do so here - you begin to realise how interesting they are, how sofisticated their social behaviour is, and how tough they are - as you get colder and colder standing there, they just go on, wait to look back, and eventually will find their nest and mate. Way to go, the penguin way !